Ai Weiwei’s exhibition According to What? ran at the Art Gallery of Ontario from August 17 to October 27, 2013. 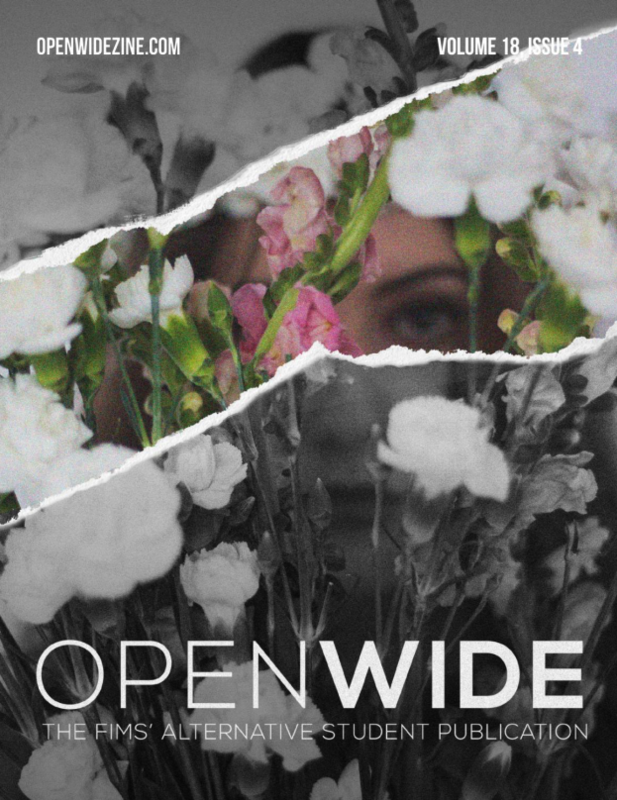 OPENWIDE’s Editor-in-Chief for Volume 14 and third year Media, Information, and Technoculture student, Chris Ling attended. Below is his review of the exhibit. His supporters call him Ài Shén, Mandarin for Ai God, and he wouldn’t back down for all the tea in China. Ai Weiwei is China’s most provocative artist to date. His exhibition, entitled According to What? ran from August to October at the Art Gallery of Ontario (AGO). 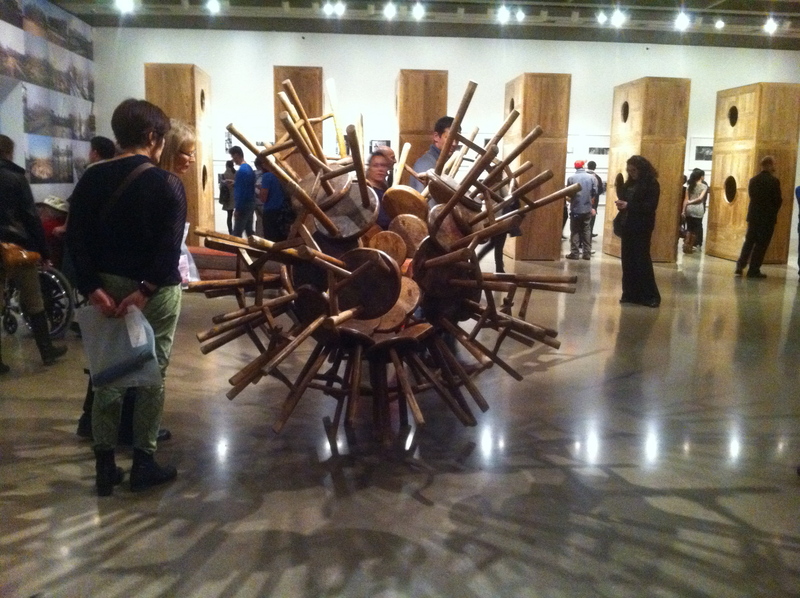 I visited the exhibition on its second-last day in Toronto, accompanied by hundreds of Weiwei’s admiring patrons. The fifty-six year old artist is as internationally famous as he is infamous in the eyes of the Chinese Communist Party. His work, which ranges from photography to vast sculptural installations, challenges the harsh censorship policies enforced by the Chinese administration. Weiwei rose to prominence as an artist during the four years preceding Beijing’s Olympic Games, during which he acted as chief designer of the Bird’s Nest stadium, the games’ architectural centerpiece. During these years, he attracted the attention of the international press for another reason: he was an outspoken critic of the social devastation caused by the national infrastructure development leading up to the games, a rare voice in such an oppressive political climate. The politically volatile nature of his art, which satirizes China’s carefully policed national image, has since earned him the reputation of dissident and radical threat in the eyes of the Chinese government. According to What? took up the AGOs second-floor gallery in its entirety – two adjoining rooms were specially modified to suit the large scale of Weiwei’s pieces. 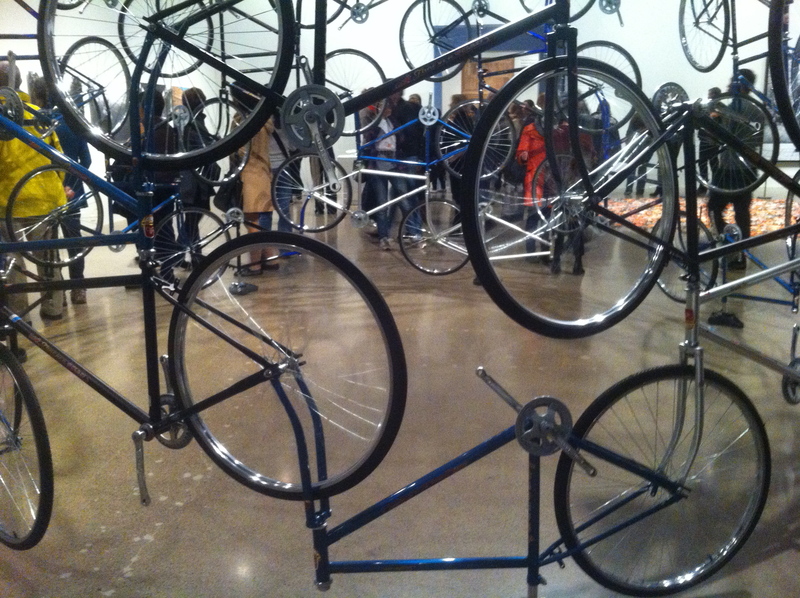 The work on display ranged from his famous Study in Perspective, in which he is photographed ‘flipping the bird’ at iconic historical sites including the White House and Tiananmen Square, to a giant ring of interconnected Chinese bicycles, a nod to the well-known French artist Marcel Duchamp. The exhibition functioned more as a reflexive self-portrait of Weiwei than as a political attack on his nation’s government, maintaining a tasteful balance of subtle critique and masterful art. The largest and hardest-hitting piece featured in the show, entitled Straight, consists of carefully arranged piles of steel rebar salvaged from the 2008 Sichuan Earthquake. Weiwei personally headed a volunteer relief effort in response to the local government’s lack of action following the disaster, which destroyed government schools and claimed the lives of over 5000 people, many of them children. A ten-minute clip documenting Weiwei’s efforts during the earthquake’s aftermath ran on a loop as part of the installation. I stood with the crowds of spectators and watched, sickened, as a team of volunteers harasses the federal officials who stand guard over the ruins of the collapsed schools in an effort to keep the buildings’ “tofu construction” secretive. After the film, the crowd remained silent: Ai Weiwei had said it all. Aggressively political pieces like Straight shock their audience, as is the intention in much of Weiwei’s work. According to What? was full of provocative content, from a Neolithic vase Weiwei adorned with the Coca-Cola logo to a series of miniature houses he constructed from over a ton apiece of China’s finest tea leaves. Weiwei effectively engaged his audience in this exhibition, entering them into discourse surrounding China’s cultural history, challenging them to reconsider an ancient culture and encouraging them to break tradition. One piece in the exhibition did just that: Dropping a Han Dynasty Urn is a composition of three stills depicting Weiwei smashing a 2000 year-old urn, a significant piece of Chinese antiquity. This piece and others in According to What? function on a deeper, more complex level of political commentary that much of today’s politicized art tends to lack. A close reading of Weiwei’s ceremonial vase smash reveals a process that has become normalized in China since Chairman Mao’s cultural revolution of the 1960s and 70s: a destruction of the old, and a violent one. Even the title According to What? is a powerful statement indicative of Weiwei’s resentment towards his oppressive government. His solidarity is reflected in works like the list of names of the earthquake victims he painstakingly tracked down. The striking visuals in According to What? have the ability to transcend any barriers of culture or language, effectively communicating their message to a receptive Canadian public. Ai Weiwei’s exhibition critiques China’s political landscape fearlessly. The artist’s work unravels an oppressive national history for a diverse audience, and the AGO proved to be an ideal venue for such exposure. According to What? sets a new precedent for political activism in art, doing so in a manner that is equal parts radical, educational, and most importantly, beautiful.